How often do you get something free for your boat that’s actually useful? Here’s your chance! For the last four years, my good friend Jan Irons and I have been writing a comprehensive cookbook for cruisers. We're really excited as The Boat Galley Cookbook's publication date (October 2012) is getting closer. 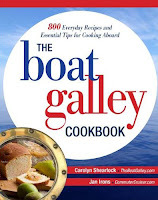 The Boat Galley Cookbook is filled with the same type of detailed information that I’ve written in my posts here, with over 800(!) everyday recipes made from obtainable ingredients without electrical appliances, plus in-depth information on unfamiliar cooking techniques, food storage, substitutions and more. Today, it’s gone to the printer. And to celebrate, we’re giving away free samples! It's a 28-page PDF, with 33 recipes and a bit of other useful info. Believe it or not, that's only about 5% of the complete book!